Forget fingerprint authentication, retinal scanning or advanced facial recognition that has recently been implemented by Apple in its iPhone X—researchers developed a new authentication system that doesn't require any of your interaction, as simply being near your device is more than enough. A group of computer scientists at the University of Buffalo, New York, have developed a new cardiac-scan authentication system that uses your heart's shape and size as a unique biometric to identify and authenticate you. Dubbed Cardiac Scan, the new authentication system makes use of low-level Doppler radar to wirelessly and continuously map out the dimensions of your beating heart, granting you access to your device so long as you're near it. In simple words, your office device should be able to recognise that it is you sitting in front of the computer, and sign you in without any password or interaction, and automatically should log you out if you step away from your computer for a lunch break. Since, according to researchers, your old ticker's shape and pulsations are unique, useful for identifying you, authenticating access, unlocking devices, and so on. The researchers said your heart's shape and cardiac motions are unique and only present in a person who is alive, and therefore are harder to spoof than fingerprint or iris scanners, making Cardiac Scan a reliable way to identify you, authenticate access, or unlock devices. "No two people with identical hearts have ever been found. And people's hearts do not change shape unless they suffer from serious heart disease," Wenyao Xu, lead author on the paper and assistant professor at University of Buffalo's department of computer science and engineering said in a Monday press release. The Cardiac Scan system takes about 8 seconds to scan a heart for the very first time, and after that, the system continuously recognises your heart, making sure another user has not stepped into your device. To test their radar design, the researchers conducted a study on 78 people and found that their Cardiac Scan system scored a 98.61% balanced accuracy with an equal error rate (EER) of 4.42%, proving that it is a robust and usable continuous authentication system. When talking about potential health effects of the heart scans, the team said the strength of the signal is much less than that of Wi-Fi, and other smartphone authentication systems, which emit harmful SAR (Specific Absorption Rate) radiation, and therefore does not pose any health concern. "We are living in a Wi-Fi surrounding environment every day, and the new system is as safe as those Wi-Fi devices," Xu said. "The reader is about 5 milliwatts, even less than 1 percent of the radiation from our smartphones." Currently, Cardiac Scan is not practical to use because of its size, but the team of researchers hopes to shrink it to the point where the system can be installed into the corners of computer keyboards and smartphones. However, there are some privacy and security concerns over the technology, like anyone can unlock your computer or smartphone as long as you are standing near your device. Another concern is that the device may end up not recognising a person if his/her heart is changed due to heart disease. 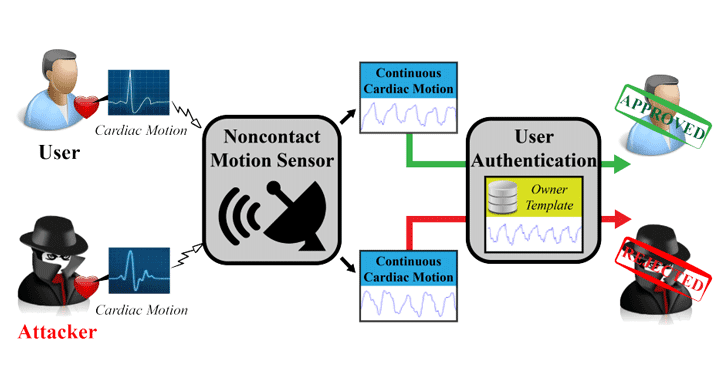 For more technical details, you can head on to the research paper [PDF] titled "Cardiac Scan: A Non-Contact and Continuous Heart-Based User Authentication System."